We were out practicing more HBDA (history by driving around) the other day, which usually is just aimless wandering, but this time we had a purpose - a purpose driven by previous aimless wanderings. It had to do with Accomac Road in York County, Pennsylvania. The name has always bugged me. The Accomac were an Algonquin band living on the Delmarva Peninsula; they didn't have much, if anything, to do with southeastern PA. At first I wrote it off as a road named by a fanciful developer, but the place didn't look like a subdivision, it looks older than that. 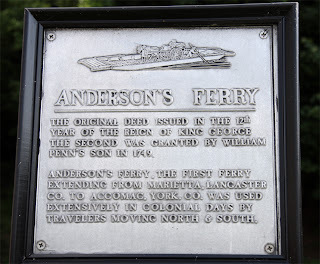 Then I read about Anderson's Ferry, one of the Susquehanna River crossings near Wrightsville. 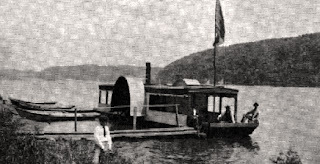 The name of the ferry boat was Accomac. "Ah ha," I thought, "I bet that road leads down to where the ferry used to cross." And sure enough it did. I can't call this some great discovery, it's just one of those little things that makes HBDA such a fun pastime for me.